This article discusses the characteristics typical of an ‘intelligent business’; a well controlled and well understood organisation able to measure its performance based on factual evidence and base business decisions on sound performance indicators. From this starting point, the various ways in which a business can recognise its own need to develop greater intelligence, the rewards offered and challenges faced in doing so are explored in more detail. Every business faces its individual challenges on a daily basis; not to mention those of the week, month and year. Whether a manufacturing business understanding production requirements for each season, or a service business planning resources for looming projects; high quality information, available when it’s needed and in a clear and accurate form is critical to making the right decisions. Planning for the future is just one part of the intelligent business. Equally, or arguably more important, is the ability to identify, explain, and understand the contributing factors involved in degradation or failure in service. Only by examining in detail the various information streams at one’s disposal can the latter be achieved; a process often complicated by the complexity and sheer abundance of data in the modern business. From staffing levels to finance, from production line machinery performance to shipping delays, every business’ information comes from different sources, but each has a key role to play in defining the performance of the organisation as a whole; the ability to collect, collate, and analyse the various sources in an engaging and accurate manner is the key to a successful development of a truly intelligent business. The intelligent business is characterised by its management’s ability to control and understand its key processes, clearly defined and communicated Key Performance Indicators, a business strategy supported by and aligned with its core business systems, and the speed at which it is able to identify, respond to, and resolve issues which have arisen or are developing. Their management information analyses only ‘out-of-band’ occurrences; in other words, always reporting by exception. The information delivered is accurate, available in the form required and available when required; preferably delivered to key consumers, rather than extracted on request. There exists, in the intelligent business, only ‘one version of the truth’; meaning that data is collected and collated into a single source, generally known as a ‘data warehouse’ which forms the core of most Business Intelligence projects. This single source forms the basis for all reporting, whether by dashboard or scorecard, static report or data-discovery tool. Its structure supports intuitive drill-downs and the more complex ‘slice ‘n dice’ capabilities so commonly described by the sales literature for reporting tools. Naturally, all of the information must come from somewhere, and it is here that the alignment of business strategy with technology becomes relevant. A well-aligned business technology and business strategy delivers systems which support and facilitate the business process, minimise business risk, maximise productivity and allow the business to concentrate on delivering exceptional products at competitive prices and providing excellent customer service. Exploiting the information within these systems allows them to deliver another benefit; that of empowering the organisation to measure its performance in detail against its objectives, and monitor progression toward its goals. System-driven information is free from the intuition of the users, delivering only facts and allowing critical decisions to be made based on the most up-to-date and accurate information. Bearing in mind this alignment between technology and strategy, it is important that systems are designed, implemented, and operated with information outputs borne in mind. Data should wherever possible be designed and stored to facilitate analysis; categorising information using a clearly defined taxonomy, for example, greatly simplifies the process of collating data from different sources. Implementing flexible systems which can accommodate changing process and information needs facilitates the management of change within the organisation, and integrating systems allows every user in every department to see the same data without bridging gaps in systems with paper, Microsoft Excel, or their own retained knowledge. Having explained the importance of being or becoming an intelligent business, it is worthwhile for a moment exploring the traits that define a business needing to enhance its intelligence; those that best demonstrate the need to develop intelligence and reporting capability. Clearly, those things which characterise the intelligent business can be reversed in order to identify the ‘un-intelligent’ business; at the most basic level, the lack of control, lack of aligned systems and systems unable to flex in order to accommodate changing requirements. As stated above, every business needs information in order to make the decisions critical to surmounting the challenges they face daily; perhaps the most obvious driver for developing the intelligent business is to generate the information which is conspicuous by its absence. Decisions are often made based on an intuition, or retained knowledge which is often lacking in factual evidentiary support, and may change based on a person’s perception of performance, understanding (or lack thereof) of the decision to be made and their own opinion of what is the correct conclusion. Whilst this may be a valuable method to support decision making in some cases, consistent, accurate and up-to-date data significantly reduces business risk. Delays in retrieving information lead to delays in resolving problems; these can have a significant impact on a business’ bottom line; consider, for example, the business whose monthly KPI reports take a week to produce. Whilst this may sound like a long timescale, it is not untypical or unusual for this to be the case. An example of this springs to mind from one of Waterstons’ larger clients; for this client, monitoring their position against competitors and making changes to pricing and promotions was proving to be a headache. Although well defined KPIs were in place, accessing the information necessary to monitor performance and revenue against their competitors was made practically impossible due to the time taken to extract and manipulate data. At this client, a competitor would lower their prices or begin a promotion at the beginning of the month. At the end of the month, our client would undertake their KPI reporting; this could take a number of days to complete. Once the KPI reports were available, our client would be immediately able to identify a drop off in sales and number of customers. Having identified the drop-off, the client would then take action to reduce their prices, or begin a promotional or marketing campaign. For the remainder of the month, business would continue as usual. Intuitively, the client would be able to identify whether their sales were returning to previous levels and customer numbers increasing, but it would not be until the end of the month and the new KPI reports before this could be confirmed. Clearly, this is an extreme example, but the frequency and time taken over reporting in this case means that should the competitor change pricing on 1st January, it would be early March before the efficacy of our client’s response could be accurately measured; and what if that response had not been successful? How long might it take then? A solution to this problem might be to report more often; if we assume that the same reporting which ordinarily takes a week is done more regularly, time will be saved as the reporting process becomes more streamlined, but it is likely that a side effect will be repetition in the reporting processes. In the case of our client, their long term vision included implementing an enterprise Business Intelligence solution. By bringing together their various data sources and integrating daily information from them, they are now able to monitor their performance against KPIs with reporting information which is never more than 24 hours out of date. The effect of changes in competitor prices and offering can now be responded to within a day of those changes being made. In the business which needs intelligence, the management will often say ‘reporting takes too long’, or ‘we’re never sure whose figures are accurate’. This is a direct result of the inaccuracies and inconsistencies in reporting and data inherent in a business where information is produced manually, manipulated by hand, and produced from disparate, un-integrated systems. Typically, someone in the business will spend much of their time extracting data from systems, then putting it into a format they are comfortable with, such as a spreadsheet, and then manipulating it. Repeat this process many times over for each of the core business systems, and one will end up with a set of reports based on data which has been, often, mapped by hand and processed so much that it may be impossible to relate it directly back to its source. Delays, infrequent reporting, manual processing, repetition, system-to-system data mapping, inaccuracy and inconsistencies in data all add up to the lack of management control routinely seen within a business with a need to enhance its intelligence, but there are other factors which typify this kind of business. These are related to a lack of commonality and alignment between the organisation’s business strategy and its business systems. Where an IT system does not exist to support a business process, the data required for reporting is often stored in the most powerful computer around which is also coincidentally the most difficult to access; the human brain. This retained knowledge is all too regularly the source of inaccuracy, and also clearly represents a massive business risk should any horror befall the information-holder. Requirements for information are often poorly defined within the business; this can be as a result of a lack of understanding of what is possible, what data is available, and what systems can be interrogated for information. It is also often the case that the required performance measures are not adequately defined or understood, and that no clear and well-communicated management information strategy exists. As a result, information is sometimes constructed by an additive process of several source reports, and quite often in an ad-hoc, undocumented and inconsistent manner. Additionally, it is typical to find considerable inertia in the information delivery process. Commonly, one finds that an ad-hoc report has been produced as the result of a legitimate query and delivered to an end-user. That end-user rarely communicates back to the producer of the information as to whether or not it has been used, been useful, or should be produced again. The report then continues to be delivered on a regular basis, whether it is required or not, with the user never challenging or reviewing their original requirement; instead they are likely to simply shred the report! It is important to recognise that in these situations, the tools and systems used to generate the reports are rarely ideal. Typically spreadsheets, paper sources, manually maintained information, and small desktop personal databases form the core of the information assets held by the business. Spreadsheets and databases do not a Business Intelligence platform make; however it would be unfair not to recognise them as important and relevant tools when used in conjunction with that platform, once it exists. What can intelligence do for your business? The hallmarks of the intelligent business, as discussed above, do not in themselves represent the output or delivered benefits of quality reporting and information. Rather, the many characteristics of the intelligent business can be ‘boiled down’ into several key benefits which work together to provide the organisation with a solid basis for measuring and improving performance and productivity, managing costs and improving quality of products and services. The first and most important benefit which can be realised is to derive a far greater understanding of the business as a whole; this encompasses all of the processes which make up the business, its key drivers and strategic goals, and the means by which success can be measured and facilitated. By bringing together the various disparate data sources and integrating their information assets into one central source the entire organisation benefits from accurate, consistent data. Benefiting from a single view of the business’ data ‘from end-to-end’ allows better decisions to be made, with all parties able to take advantage of the ‘single version of the truth’, which provides factual support for the decision-making process and its stakeholders. Using consolidated information to facilitate decision making is of great value; a well designed and implemented Business Intelligence platform will deliver high quality data to the business, spanning systems and data sources, business units, and personnel roles, but this represents only half the story. In order to derive the greatest benefits, data quality must not only be proven, but also accepted and trusted by the business. This critical change management issue could all too easily lead to the failure or devaluation of the Business Intelligence project or management information platform; the organisation must ensure, through communication and the commitment and buy-in of senior managers that the whole business is made aware of the importance and value of the information which will be provided by the project, and that the information can and should be trusted. Only trustworthy data will lead to a successful project delivery and success in the ongoing use of the platform. Every business has its own set of unique strategic goals and development aims; these could be to manufacture more products, improve process efficiency and reduce costs, enhance customer service effectiveness, develop and market new products, or any number of others. Unfortunately, all too often a lack of alignment between strategy and systems is identifiable within businesses; as a result one can infer a need to develop the intelligence and reporting capabilities of that organisation. To succeed in achieving the strategic goals, the ability of good quality business technology to act as an enabler to the business should be exploited; well implemented, properly integrated systems provide the user day-to-day with all of the tools they need to do their job and act as a technology accelerator to facilitate business improvement. They will produce the key information and data needed to make the right decisions and changes also needed to achieve the business goals. A direct result of providing staff with good quality information, and communicating a clear business strategy is that they are provided also with a means to visualise ‘the bigger picture’ and empowered to make decisions aligned with the overall strategic objectives of the organisation. It is important to note that whilst there are numerous different ways to actually implement a Business Intelligence solution, the process of selecting a technology platform, vendor, or product is not one which should be undertaken too early. Different businesses require different solutions, and whilst there are only a few different overall approaches to delivering Business Intelligence, the choice of the correct one, and the products which will deliver it, should only be made once certain pre-requisite tasks are undertaken. 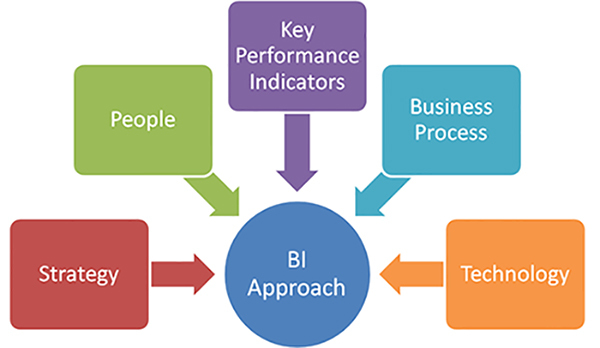 Many businesses do not have a well defined business strategy; it is important that the Business Intelligence project starts from a well defined baseline, which requires the business to develop and agree a business strategy and goals against which the management information platform delivers data used to monitor progression. Waterstons encourage their clients to undertake an exercise to clarify the business strategy and its discipline driver (as described by Treacy and Wiersema) in order to gain the detailed understanding of their business concomitant with the definition of its goals and objectives. 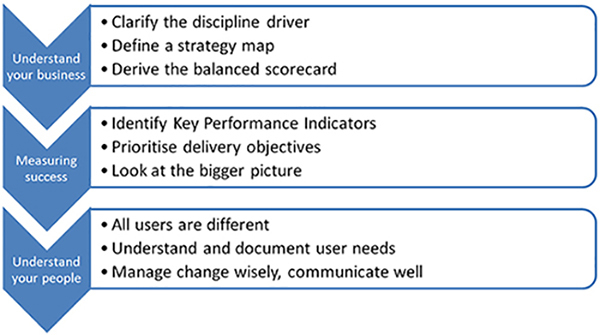 This exercise produces an output in the form of a top-down strategy map following the principles of Drs. Kaplan and Norton. This strategy map takes a ‘top-down’ approach to the business, identifying its financial drivers, the perspectives of its customers and internal people, and mapping these to strategic objectives for learning and growth. Waterstons’ adaptation of the Kaplan and Norton model includes a further layer for business technology systems, in which the key systems, supporting infrastructure and information processes required to align the IT function with the business’ strategic goals are identified. From the strategy map, a balanced scorecard can be directly derived, a process and outcome again based on the principles of Drs. Kaplan and Norton. This method of visualising strategy has been used extensively by Waterstons for a number of years; not only to drive the creation of balanced scorecards and hence facilitate KPI definition and Business Intelligence strategy, but also to support IT strategy alignment projects, determine strengths and weaknesses in business and technology alignment and provide customers with a powerful tool with which to better understand their business. Using the Kaplan and Norton map as a central part of the IT strategy allows customers to easily relate business goals to technology platforms, irrespective of their level of technical understanding; this greatly eases the process of gaining senior-level buy-in to IT projects, as return on investment can be easily understood in the context of their business and their specific strategic goals. 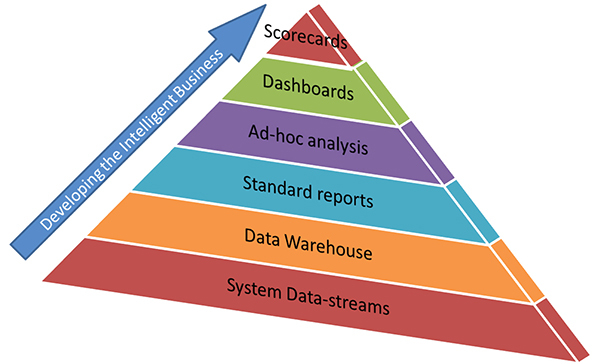 Balanced Scorecards alone cannot drive the development of a Business Intelligence strategy, however; in order to create a far reaching and functional management information environment, the organisation’s Key Performance Indicators, and the sources of information necessary to report against them must be identified. 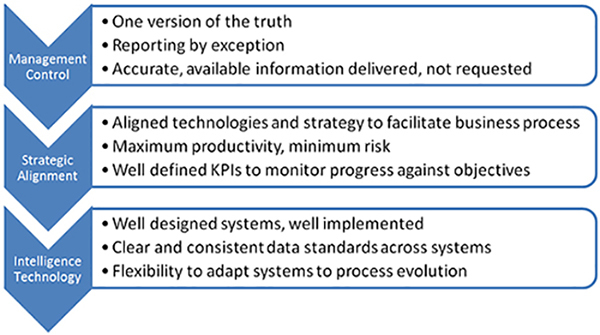 KPIs must be driven by business needs, not by the information sources and business systems available; and they must identify what can be done in order to significantly improve process or increase productivity or performance. They will form a set of measures which focus on the aspects of performance most critical for the current and future success of the business; additionally the Business Intelligence solution will produce information related to the Key Result Indicators which provide information from which historical performance can be identified. The KPIs identified must be prioritised for delivery; the Business Intelligence implementation cannot and will not deliver data to measure performance against all KPIs at the same time. As data sources are integrated, some KPI measurements can naturally be delivered quickly, and it is important that the more important and more valuable are concentrated on before moving through the often extensive list of performance measures. From the point of view of delivering value, and also to assist with buy-in and acceptance of the solution, it is important to understand the end-users’ requirements of the Business Intelligence platform. Initially, an exercise to identify the various groups represented within the user community should be undertaken; there will almost always be operational, management and executive groups, but others may become apparent through this exercise. Each of these user groups will require their information to be delivered in different forms; the operational user will often need only a small sub-set of the available data to be provided, and often in a static and ‘non-rich’ fashion. Managers require information supporting an overview of their area of responsibility, but need the ability to drill-in in order to answer questions and queries arising from the top-level data. Executive level users will often wish to be delivered only a high-level overview of the whole business; showing the performance of individual business units this allows them to identify at-a-glance any potential or developing performance problems. They may require and be given the ability to drill-in to the data, although often this level of detailed exploration will be left in the hands of senior managers with the executive team looking only at the bigger picture. Understanding the specific needs of each identified user group, and properly reviewing, challenging, and documenting their requirements is a useful exercise which will pay dividends when it comes to selecting a Business Intelligence approach, products and implementers. Ensuring that the final solution is well matched to the users’ requirements further assists in smoothing out the change management process and in gaining the buy-in which will be so critical to the success of the project. Business Intelligence is not the implementation of a product, not the selection of a system, and certainly not producing information in volume. It is a far-reaching concept which can have a fundamental and profound effect on a business. It is sufficient, in order to begin the process of working towards utopia, to begin with the simplest concepts; understanding your business and its critical success factors, understanding your people, and understanding the ways in which success is measured; in recognising the need to develop into an ‘intelligent business’, and preparing the ground for moving forward into an implementation, no technical details have been worked out, no products selected, and no overall approach identified. Focussing on working towards a ‘Business Intelligence system’ rather than an ‘intelligent business’ cannot deliver the greatest benefits which can be derived; a software product or platform must be seen not as the means of delivery of an intelligent business, but solely as a support for the critical elements of that delivery; a clearly defined set of strategic objectives, and well understood and communicated performance measures that every member of the business can buy into. It is also worth making the point that whilst the purist approach discussed above takes a linear path to a utopian solution, the real world of Business Intelligence rarely follows this pattern. Businesses are constantly evolving, and change is an unavoidable part of any organisation. The business which decides to invest in intelligence must recognise that putting perfect systems and processes in place to support their information requirements is an unrealistic and unachievable goal. A realistic approach to the process is critical; whether tackling the business department by department, accepting that some manual processes will be involved in maintaining the data warehouse, or welcoming Excel spreadsheets and Access databases into the Business Intelligence fold, the pragmatist realises that whilst striving to achieve perfection is admirable, it is also unattainable. Moving onward, the business will face key technical challenges as it enters the conceptual design phase, before undertaking implementation and subsequent maintenance of the selected management information platform and its constituent parts. Whilst these challenges can be complex in nature and time-consuming to solve, a set of clear objectives for the final delivery will simplify and facilitate the development of a tool which will rapidly take its place at the heart of your business; moving forward with this knowledge allows any challenge to be overcome. Perhaps the most important point to be made is that there is no ‘one size fits all’ approach to Business Intelligence, and much less so a ‘typical’ solution. Just as every business is different, with its own unique strengths and weaknesses, every Business Intelligence platform, every reporting and management information mandate is equally unique. Even businesses in the same sector, directly competing for the same business from the same customers, will have their own requirements of their solution; whilst there will always be a requirement to measure cost, revenue, profit, and productivity, the precise means by which this will be achieved can differ wildly. Is your technology costing you, or providing you with competitive advantage? As I’m coming up to two years managing the desk, I’ve been reflecting on how I felt stepping into the role and the things that I wish I’d known.